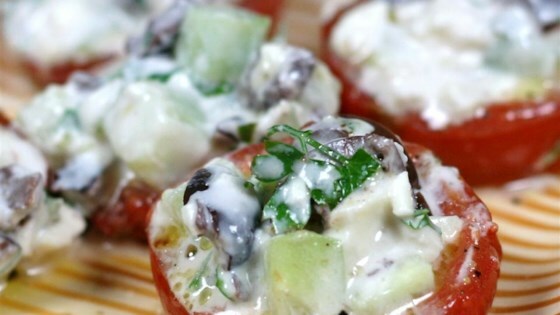 "All the ingredients of a Greek salad stuffed in a baked tomato shell. Serve with your favorite lamb dish, or as an appetizer." Slice tomatoes in half, scoop out seeds, and place in a baking dish sliced-side up. Sprinkle with and salt and pepper . Bake for 5 minutes. Remove tomatoes from oven, drizzle with olive oil, and bake an additional 10 minutes. While baking tomatoes, mix together cucumber, yogurt, olives, basil, and sugar. Stir in feta cheese. Season to taste with salt and pepper. Remove tomatoes from oven, fill with cucumber mixture, and sprinkle with parsley. Serve immediately. Made this as a side dish with chicken. Wonderful, easy and quick. I usually really research my recipes, but this one got under my radar. Never again! The yogurt ruined it for me. I was very disappointed because normally I love these ingredients together but this was just a waste of them. This was easy to make after all the preparation was done. I would make it again. It tasted great.